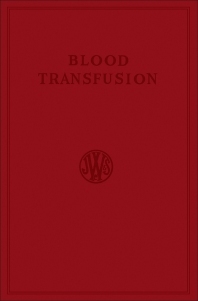 Blood Transfusion is a compendium of papers that deals on development made in blood transfusion and serology. One author reviews the history of blood transfusion from the dawn of human history until Dr. Thomas Sprat discovered an ideal method in 1657. One paper discusses the indications for blood transfusion such as acute hemorrhage, traumatic shock, thermal burns, surgical shock, or intestinal obstruction. Another author describes the possible complications that may arise from blood transfusion. These complications include hemolytic reactions, simple febrile reactions, allergic or anaphylactoid reactions. One paper describes the different blood groups: ABO, MN, P and other human red-cell agglutinogens, RH, and the Human Blood Group Substances. In administering blood transfusion, one author points that an adequate prescribed volume of compatible blood at the correct speed and temperature should be administered with little stress on the part of the patient. Other authors discuss blood transfusion in infants, blood storage, the use of blood derivatives and blood substitutes, as well as the structure of a well-organized hospital blood transfusion department. This book can be helpful for hospital and clinical health services workers, students of nursing or medicine, as well as persons undergoing training in first aid and emergency procedures.